Don’t waste your food, make quiche! Last week I was introduced to a great organisation called Feeding the 5000. It’s a UK based organisation, working worldwide to fight food waste. J and I spent the afternoon in central London, helping them distribute perfectly good peppers and cherry tomatoes that were rejected by the supermarkets for not being ‘perfect’ enough to go on their shelves. The cleaver thing is that the Feeding the 5K guys didn’t just give away the vegetables. To anyone who would stop and listen to our shpiel, we gave out a bag with lots of veg which included a recipe for Gezpacho soup by celebrity chef Hugh Fearnley-Whittingstall. We asked them to maybe make the gezpacho and invite friends over to enjoy their soup, and in the ‘pop-up’ restaurant spirit maybe ask them for a donation to the organisation and sign up to the no-food-waste pledge. This activity really brought to light the detachment we have from the food production process and the lack of awareness to the amount of food that is wasted every day. At the end of the afternoon, we were still left with a good amount of peppers and as the City people went back to their offices we loaded our bags with peppers and headed back home to grill, cook and preserve about 30kg of red, yellow and green peppers. There are a few steps to this quiche, but it can be made all in one go. Note about the herbs: Use any herb combination you like/have. If you don’t have fresh herbs, use dry. Heat the oven to 250˚c and line a baking tray with aluminium foil. Take another (smal-ish) piece of aluminium foil, place it flat on your work board and dress with a little olive oil, salt and a sprig of thyme, then cut off the bottom of the garlic bulb and place it, cut side down, on the dressed foil. Wrap up the garlic and place it on the baking trey. 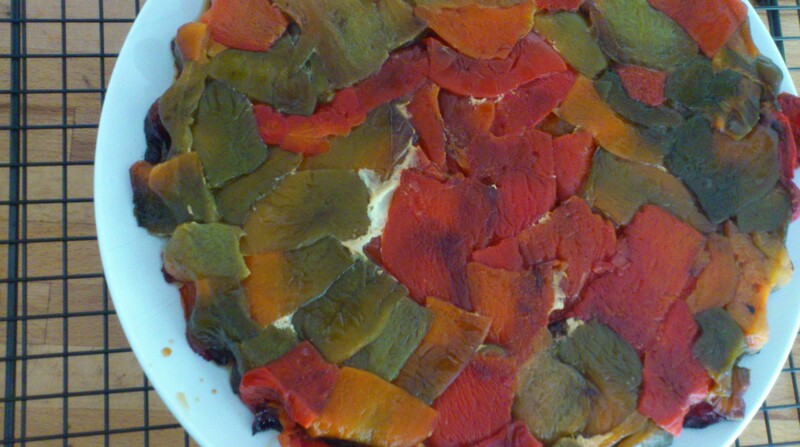 Place all of your peppers, whole and washed, on the baking tray and place in the hot oven. Important: the peppers need to be turned every aprox 10min so they are evenly roasted on all sides. After the peppers are roasted remove from the oven and lower the temperature to 170˚c. Set the roasted garlic aside to cool. Place all the peppers in a large glass bowl and cover the top with cling film. Leave the peppers to steam and cool. This process with make separating the peel from the flesh a very easy job. Whilst the peppers are steaming and cooling, make the quiche filing by combining all the ingredients and whisking them in a bowl. Don’t forget to unwrap the garlic and squeeze the roasted cloves into the batter. Peel the roasted peppers, one by one, by pulling the loose burnt bits away from the soft flesh, then gently remove the flesh from the stem, trying to pull from the bottom, so the seeds stay on the stem. Gently slice the flesh on one side so the pepper can be spread out flat, then clean any seeds from the surface. When all your peppers are peeled and clean, start lining your pie dish with the peppers, making sure they overlap so the filling doesn’t seep through, just like a normal pie crust. Pour in the filling batter and bake in the oven for 35min, or until the filling is slightly wobbly but not runny. Remove from the oven and let cool for at least 15min, then place a plate , up-side-down on top of the pie and flip it over (do this over the sink as there will be some liquid spilling out). 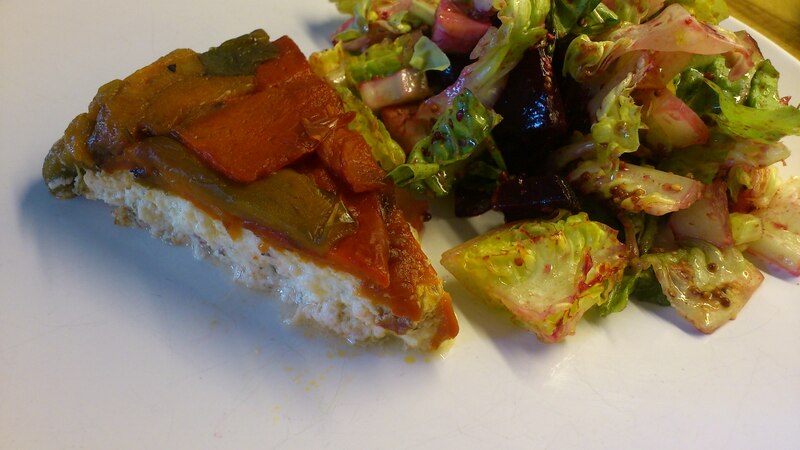 Release the quiche from the pie dish and serve with salad. As one of the recipients of this recipe I can strongly recommend it. No more soagy and stodgy out crust. Instead yummy flavour some peppers. It was light yet filling at the same time. My only point is that this uses a lot of peppers, so either combine with other veg (not sure if this is possible) or make if you have a glut of peppers to hand.